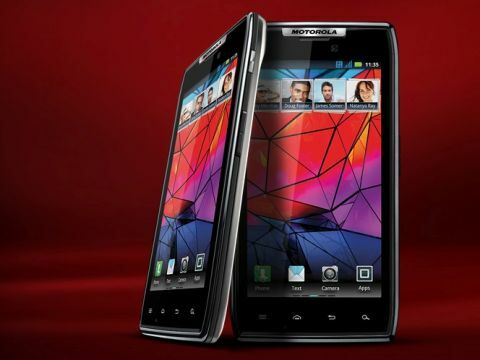 Motorola's best Android phone yet - but doesn't quite match up to the best on the market. We've updated our review to include a greater range of camera shots and to reflect a price drop to just £21 per month on contract. The familiar Motorola Razr brand is back, but this time it's re-imagined with Android 2.3.5, an 8MP camera with Full HD recording and a super slim chassis that's just 7.1mm. That doesn't make it the thinnest phone in the world, as it's still got a thicker end to it at the top of the phone - but given you don't hold that section, it certainly feels slim. However, lumping most of the components at the top does make it feel a little oddly-balanced in the hand, although it's only 127g heavy (incidentally, the original Razr was 95g - but that didn't have GPS, Wi-Fi, 3G or a camera on board). It can also be had for just £21 per month on a contract these days, which helps it enormously to battle with the rest of the dual-core brigade. The screen is also oddly designed in our opinion, with a large amount of chassis surrounding the display. This means that, despite being 4.3-inches in size, it does look smaller than similar screens. That's not to take anything away from the Super AMOLED technology used, as it's top notch: we're talking qHD resolution (960 x 540) and clear and crisp colours making it a joy to use. The design of the phone is slightly odder though: it's a very angular design, and elements like the power / lock key take their cues from the likes of the Milestone range, with golden coating and ridges to make it easier to find in the hand. The front of the phone is sparsely populated, as we've come to expect from many mobiles at the moment - we're talking a front facing camera (1.3MP) and the four Android keys. We're always pleased to see the search key added, as it make contextual search for things like Music or Emails that much easier. The top of the phone features three ports: the 3.5mm headphone slot, the microUSB port and another for the mini HDMI lead, which sadly doesn't come in the box but allows you to pump content to a larger display. It's a unibody design, obviously to preserve the super thin form factor - this means that you can't access the battery or take the back off. The only way to pop in a microSD card or the microSIM that this phone takes is to pull down a small flap on the side. However, we encountered no freezes so never needed to rip out the battery, and the SIM and SD set up was super painless too. The Motorola logo at the top could be better quality in our opinion, as it was scratched within a couple of days' use. There's no camera button to speak of, but the 8MP sensor on the rear is joined by a single (but bright) LED flash and the speaker grille, which offers up some pretty loud sound for such a small opening. We found the larger screen was just about OK for manoeuvring around with a single hand - we had to stretch to reach items on the far side of the display, but on the whole it was pretty good and easy to use.